Aric Almirola picked up the 10th last-place finish of his Monster Energy NASCAR Cup Series career in Sunday’s Overton’s 400 at the Pocono Raceway when his #43 Smithfield Ford was involved in a multi-car accident without completing any of the 160 laps. The finish, which came in Almirola’s 229th series start, was his first of the season and first in a Cup Series race since last fall’s Homestead finale, 22 races ago. Easily the biggest story of Almirola’s 2017 was his brutal accident at Kansas and his subsequent recovery. That night, on May 13, Almirola was sitting 20th in points. 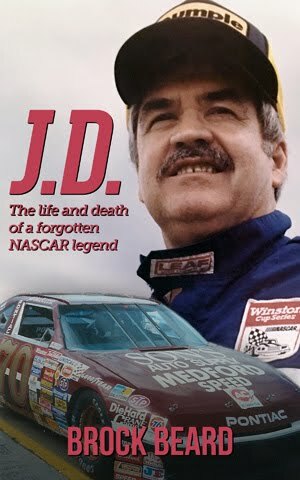 He’d finished 4th in the Daytona 500 and though he incurred a post-race penalty at Talladega, he hadn’t scored a single DNF. That all changed on Lap 199, when his #43 Smithfield Ford was caught in the debris field caused by Joey Logano and Danica Patrick’s accident, sending him hurtling into the wreck. Cut from his car and transported to a local hospital, Almirola was diagnosed with a compression fracture to his T5 vertebra. 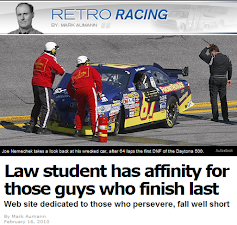 He was slated to miss eight to twelve weeks, but nine weeks later, he was back at the track, finishing 24th at Loudon. A 13th-place finish in the crash-filled Brickyard 400 carried him into Sunday’s race at Pocono, just his third race back. An abbreviated two-day schedule saw Almirola run 29th and 28th in Saturday’s two practice sessions, then narrowly missed the cut for Round 2 in Sunday morning’s qualifying, putting up a lap of 174.544mph as one of only 11 drivers to attempt three timed laps. The run put Almirola 25th on the grid. 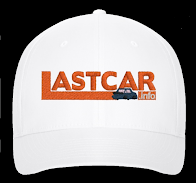 Starting 38th in what was, for the second-straight Pocono race, the shortest Cup field at the track since June 1991, was current 2017 LASTCAR Cup Series leader Jeffrey Earnhardt. Earnhardt was the only driver to not complete a lap in qualifying, and when the team was forced to change batteries, they incurred a redundant “unapproved adjustments” penalty. Joining him at the rear was Derrike Cope, back with Premium Motorsports in the #55 Toyota for the first time since the June race at Pocono, who was penalized for missing the driver’s meeting. Two more drivers fell to the back voluntarily: the #15 LaColombe Coffee Chevrolet of Cope’s teammate Gray Gaulding, and Stephen Leicht. Leicht, making his first Cup start since he locked-up Rookie of the Year in the fall of 2012, was on Thursday tabbed to drive BK Racing’s #83 Dustless Blasting Toyota. When the race started, Leicht began to lose touch with the rest of the field, and was already five seconds behind the leader as he entered the Tunnel Turn. Suddenly, as the field entered Turn 3, 15th-place starter Matt Kenseth lost control as he raced inside of Jimmie Johnson for 14th. As Kenseth slid slowly up the track, the entire rest of the field bunched up, triggering an eight-car accident. The two principals in the ensuing last-place battle found themselves on opposite sides of the crash. At the front, Almirola rear-ended the #95 FDNY Foundation Chevrolet of Michael McDowell as he slowed behind Kyle Larson, destroying the nose of #43. At the rear, Matt DiBenedetto slowed his #32 as Austin Dillon spun directly in front of him. As Dillon spun up the track to collect Paul Menard and Chris Buescher, DiBenedetto drove his left-side tires onto the grass separating the track from the access road. First Buescher, then Almirola spun into his path, and DiBenedetto cut the #32 harder to the left. It was too late. At the instant DiBenedetto’s splitter dug into the grass, the right-front of the #32 clipped the nose of Almirola’s car. 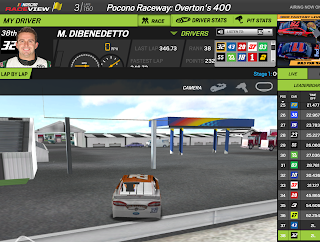 DiBenedetto’s car then dug into the dirt once more, sending a volley of dirt and grass showering all over the track. Leicht, still last at the time, slowed as he arrived at the scene, then picked his way through the wrecked cars, dropping those involved to last. 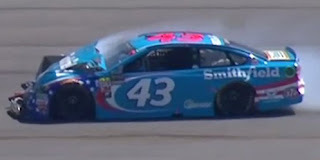 As Leicht drove by, attention turned to the two cars with the most serious damage – Almirola and DiBenedetto, which were now ranked 37th and 38th. DiBenedetto never stopped after his contact with Almirola and drove his battered car slowly down the apron. 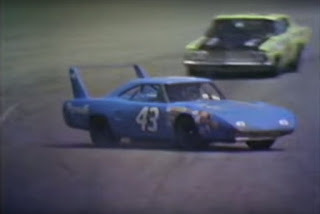 The right-front of the #32 was battered and bent from the contact with the #43, and the hood and front valence were both visibly warped from the splitter digging into the grass. He then pulled into his pit stall, No. 37, which was six stalls away from the start / finish line. Almirola fired his car up and followed DiBenedetto to pit road, but with much heavier damage to the nose, the car was billowing smoke. Unable to see past the buckled hood, Almirola stopped his car in the middle of pit lane several feet behind DiBenedetto’s pit stall. There, Almirola climbed out of the car. Like the #32, the #43 had not crossed the start/finish line. While both Almirola and DiBenedetto were eliminated from the race under NASCAR’s new “Crash Clock,” the new rule caused a scoring error as it conflicted with pre-2016 crash protocol. Under traditional NASCAR rules, had both DiBenedetto and Almirola needed to both be towed to the garage area from where they first stopped, neither would have been credited with completing a single lap of the race. The finishing order - and, thus, who finished last – would have been determined by each car’s running order the previous lap. Since this wreck happened on the first lap of the race, who finished ahead of who would have been determined by their original starting position. Under this scenario, DiBenedetto would have been credited with last because he qualified 29th while Almirola started 25th. However, when both cars were brought to the garage area, their positions changed. Over the next three laps, both cars were brought to the garage through the first opening after DiBenedetto’s pit stall. 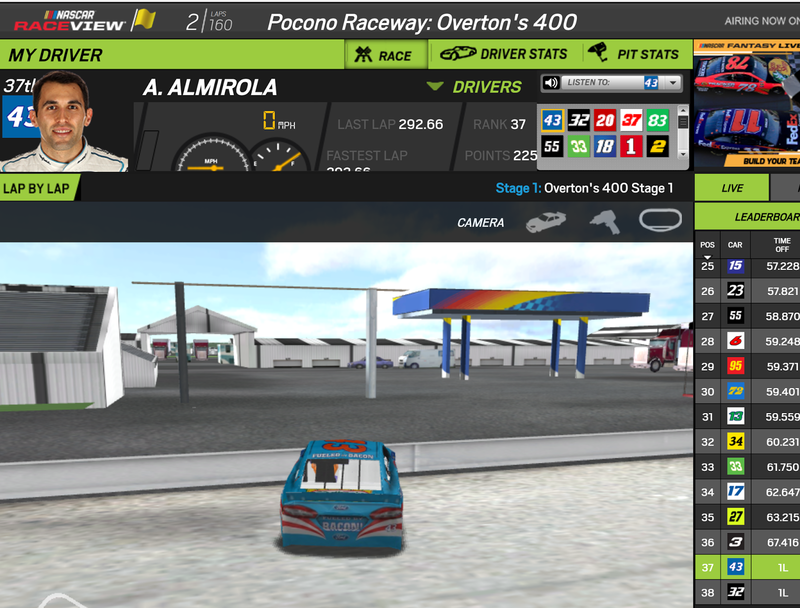 Since this opening was at the exact same spot as Pocono’s start / finish line, driving into the garage area would cause that car to complete that lap. Whoever reached that opening first would be credited with completing that lap first, ranking him ahead of the other wrecked car (instead of relying on starting position, as above). car pulled into the garage first on Lap 2, followed by DiBenedetto on Lap 3. Both RaceView and NBC Sports interpreted this to mean both cars drove into the garage area under their own power, and thus Almirola was 37th with DiBenedetto 38th. A similar situation happened in the 1970 Daytona 500, where Richard Petty blew the engine on his own #43 on Lap 8. As he pulled into the garage area, Cecil Gordon’s #24 Ford followed Petty into the garage, citing a busted a-frame. Thus, NASCAR scored Gordon, the second car entering the garage, as finishing last, but on the same lap as Petty. from 1970. While both Petty and Gordon drove into the garage under power, only DiBenedetto actually drove into the garage. Almirola had climbed from his car on pit road, and on Lap 2, his car was towed past the #32 into the opening at the start / finish line. Thus, even though Almirola’s car “beat” DiBenedetto’s to the garage area, the fact that it didn’t do so under power invalidated the “pass” of the #32 on pit road, keeping #43 in last. 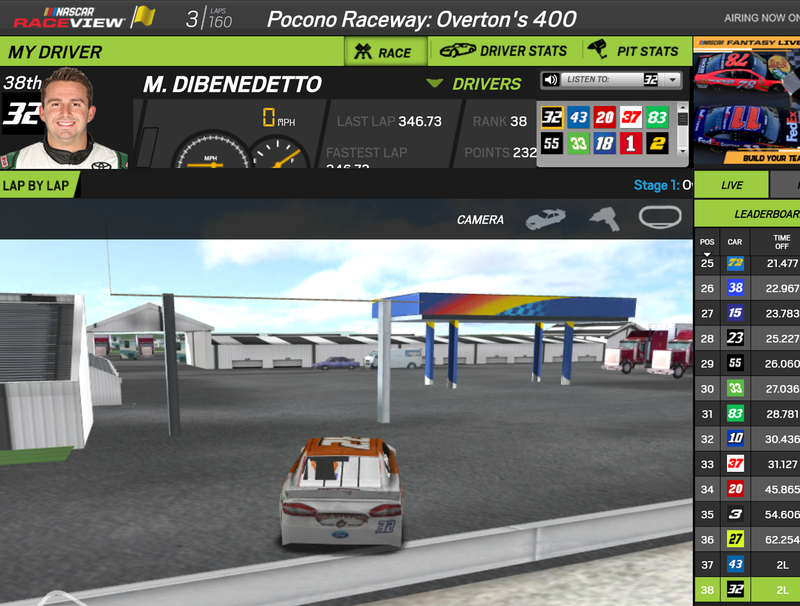 By driving through the opening, and thus over the start / finish line, DiBenedetto was credited with one lap complete. Almirola’s car, by virtue of being towed, didn’t complete that lap. The “Crash Clock” only served to lock-in those two finishing positions, ranking Almirola behind DiBenedetto. 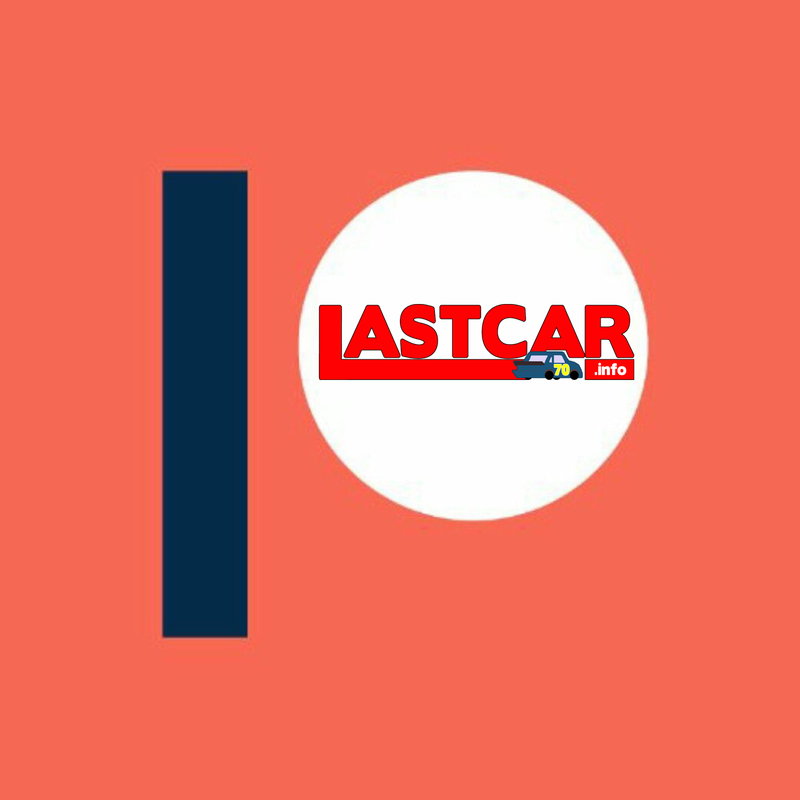 In essence, DiBenedetto had completed exactly one lap while Almirola had run all but the last few feet of his – one of the closest LASTCAR battles in recent memory. 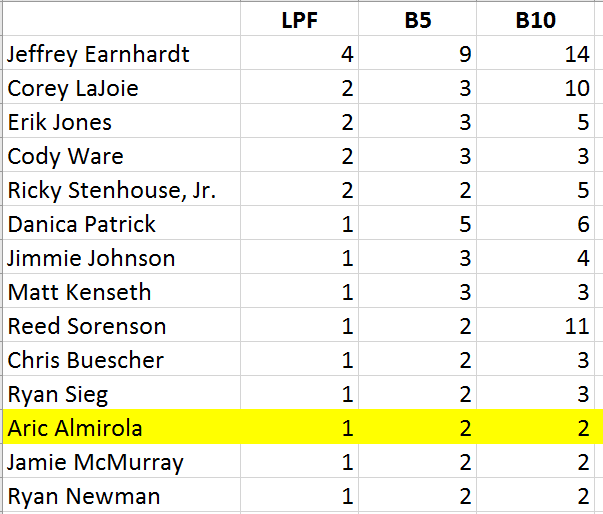 This result, showing Almirola in 38th and DiBenedetto one lap up in 37th, was properly indicated from the start both by NASCAR.com’s online leaderboard as well as Pocono’s trackside timing and scoring in the media center. While RaceView’s results were never corrected, NBC Sports updated their results when the post-race crawl was first shown. 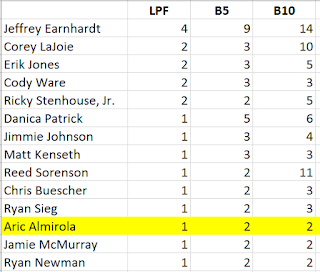 The unofficial race results, Racing-reference.info, and on Monday, NASCAR’s official race results, all showed Almirola in last. Only then was this article written. There was no such controversy over the remainder of the Bottom Five. 36th went to Jeffrey Earnhardt, whose #33 Hulu Chevrolet shut down on Lap 17, returned to the track ten circuits later, then lost oil pressure on Lap 33. 35th went to Jimmie Johnson, whose #48 Lowe’s Chevrolet tangled with teammate Kasey Kahne off Turn 3. Derrike Cope rounded out the Bottom Five in 34th as transmission issues stopped his #55 Sundance Vacations Toyota. 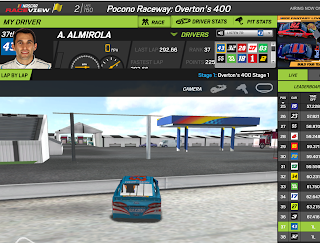 *This marked the second last-place finish for both Almirola and the #43 at Pocono. Both trailed here in June 7, 2015, when his #43 Nathan’s Famous Hot Dogs Ford had engine trouble after 88 laps of the Axalta “We Paint Winners” 400. *This was also the first time a Pocono last-placer failed to complete the opening lap since July 28, 2002, after Steve Park’s spectacular accident with teammate Dale Earnhardt, Jr. during the first moments of the Pennsylvania 500.